"Babe! Have you heard this before?!" I asked my husband with excitement. I experienced a huge emotional trauma during my third pregnancy when I discovered my husband was having an affair. My immune system was greatly impacted. If that wasn't hard enough, seeing the same thing passed down to my younger two children in utero sure is. Each of them have severe eczema on their ams and legs, and they are far more prone to picking up a cold then my first two kids are. It's heartbreaking to see two small children fight to stay healthy. While we have been vigilant to support our bodies in the best ways possible with diet, we had NEVER considered adding minerals to the mix. After learning how our bodies are greatly affected by a lack of minerals in our diet, I knew it was the next thing to add to our regime. I threw Mineral Essence from Young Living Essential Oils in my subscription box, and called it a day. How am I going to get these babies to drink this stuff? I don't want to ruin the blissful taste of Ninxia Red. lolololololol. 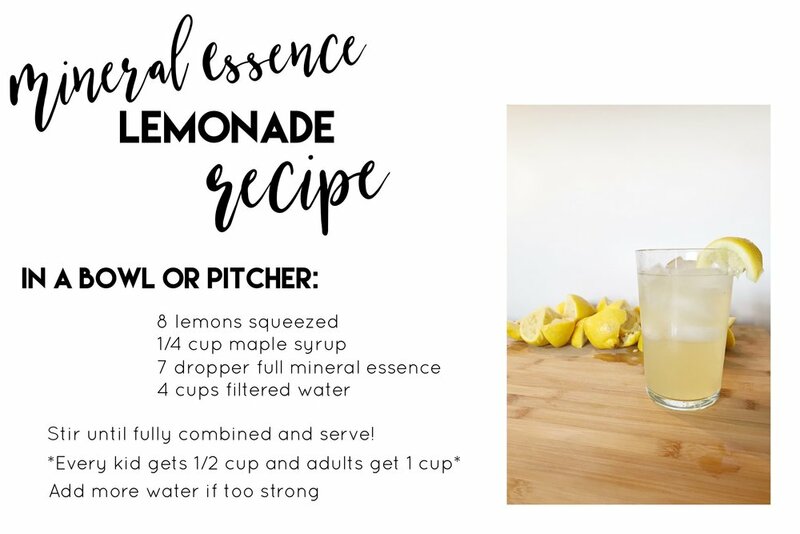 Then I remembered hearing of a recipe from another fellow mom, who adds hers to lemonade-like recipe and she swore her kids loved it. So I pulled out the bag of lemons and got to work. The kiddos all guzzled it down, and so did Burris and I! Very simple to do and man oh MAN I feel like the best mom ever. You could make a large batch and drink some every day, if you wanted! Due to popularity, ours didn't last long, but I intend to keep the stuff flowing. Mineral Essence from YL won't do that. Because there are essential oils added to the minerals, your body will actually absorb them. Where as if they aren't present, the minerals are likely to go in and out. So def give these a shot, even if you have done that before. I am super pumped to add this to our routine! And that my kids will drink it! Can't wait for you to try this for yourself! And. Make sure to check out the importance of minerals being in your body. They allow us to thrive in AMAZING ways!